"The love of repetition is in truth the only happy love." So says Constantine Constantius on the first page of Kierkegaard's Repetition. Life itself, according to Kierkegaard's pseudonymous narrator, is a repetition, and in the course of this witty, playful work Constantius explores the nature of love and happiness, the passing of time and the importance of moving forward (and backward). The ironically entitled Philosophical Crumbs pursues the investigation of faith and love and their tense relationship with reason. Written only a year apart, these two short works are a perfect introduction to Kierkegaard's philosophy: playful and profound, they explore notions of love and time, selfhood and Christianity, and pave the way for his later major works. These are the first English translations to convey both the philosophical precision of the originals and their literary quality. Edward F. Mooney's Introduction deftly guides the reader through Kierkegaard's key arguments and concepts, while helpful notes identify references and allusions and clarify difficulties in the texts. 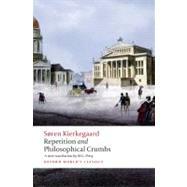 M.G.Piety has published numerous articles on Kierkegaard in journals and books. She has spent more consecutive years in Denmark than any other English-speaking Kierkegaard scholar and in the words of a Danish scholar, she is unique among translators of Kierkegaard in her mastery of Danish. Edward F. Mooney is the author of On Soren Kierkegaard: Dialogue, Polemics, Lost Intimacy and Time (2007), and two other books on Kierkegaard, and has published over fifty articles on topics in philosophy, ethics, philosophy of religion and more.